As a kid, I used to love to eat processed cinnamon swirl bread. It was so full of sweet cinnamon flavor. The best way to eat it was to toast it and top it with a dollop of butter. Peter Reinhart’s Cinnamon Raisin Walnut Bread recipe does not yield the same overly sweet and chewy bread with perfectly swirled cinnamon, but the resulting bread is wonderfully soft, fluffy and perfectly dotted with raisins and nuts. 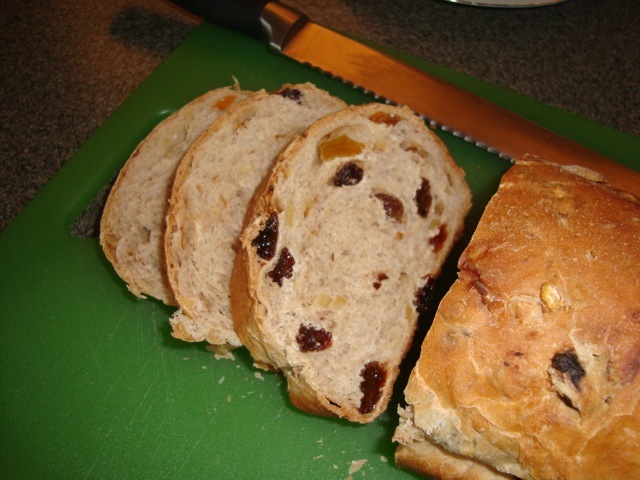 The recipe makes two loaves and is the perfect bread for sharing. I brought my second loaf to work on a Monday morning and by 10 a.m. everyone was happily munching on the raisin bread. To read more, go to http://summerofbread.com/2010/07/a-walk-down-memory-lane-with-cinnamon-raisin-walnut-bread/.